Our first athlete of the month is Dave S.. A shout out to Dave for coming in with a great attitude, cracking a joke or two, cheering others on, being supportive in the CFSWP community, (ya, you can usually find him here at an event or potluck gathering), making new members feel welcome and helping those around him. You can WOD with Dave at noon or in the 4:30 or 5:30pm evening classes. Thank you for sharing with us and for being apart of our CFSWP family! If you do not know David, make sure you introduce yourself and congratulate him for being CFSWP June’s athlete of the month! What motivated you to start CrossFit? I’m cheap and you had a Groupon. OK, seriously: I’d worked out all my life but I’d never enjoyed doing it. Running, swimming, lifting weights, biking…everything seemed like a chore. It was all boring and tedious and not all that productive. I’d never tried any Olympic style lifting and to be honest I was actually pretty scared of it. I was worried I would hurt myself. A female coworker of mine, who does Crossfit with her husband basically talked me into it. It sounded like she loved it, and I wanted to give it a try. After starting I was hooked. It’s great to be around so many people, day in and day out, who are all working in the same direction. We have a lot of fun. Favorite WOD? “Murph”, by far. You know you’re in for a grind before you even start, but I never thought I’d have that much fun on a 45+ minute workout. Least Favorite WOD? Karen. Seriously, 150 wall balls? That’s just ridiculous. I felt like I was walking on rubber stilts for about three days after doing that one. Favorite Lift? Snatches. I feel like a mutant superhero when I hit one of these and it “clicks”. There’s so much of a thought process that goes into it, and I feel that it’s just as much of a mental test as a physical one. Least favorite lift: Snatches. I’m terrible at them. Even on days where they feel good I can just tell I have so much more work to do on them that it’s a little demoralizing. What were you doing before CrossFit? Mostly running, some weight lifting and swimming. What were your thoughts after your first CrossFit workout? I’m really out of shape. How did that happen? What were your goals when joining CrossFit? I just wanted to give it an honest try. I didn’t know what to expect, or if it would “work” for me. My first goal was to keep an open mind, and to not hurt myself while I was learning a lot of new things. Have you achieved any of those goals? Absolutely. I went from keeping an open mind to trying to talk everyone I know into trying it for themselves. Has CrossFit affected your life outside the Gym? Sure, I get super grumpy if I can’t make it in to the gym to WOD. What are some of your best achievements inside the box? Just getting to where I can do some of the harder movements during WODs was a big deal for me. Being able to rep (to some extent anyway) handstand pushups, double-unders, and muscle ups is pretty fun. Do you have any other special memories/ achievements during your time here? 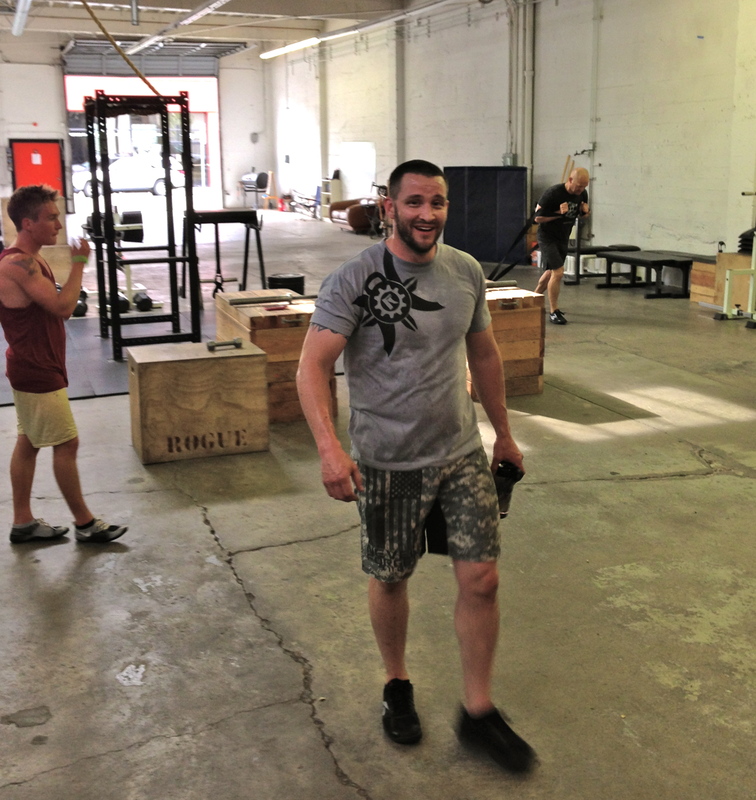 I recently had a chance to go and see some of the best in the region compete at the Crossfit Games Regionals. That was really fun. Humbling, impressive and just all around enjoyable. What advice would you give to a newbie just joining CrossFit SW Portland? Take your time learning the techniques early. Weight, reps and speed will all come with practice but good technique will keep you from getting hurt, or wearing down. That way you won’t have to take as much time off, and you’ll get better that much faster. And just have fun. Something you might not know about you is? I have ten fingers and ten toes. True story.